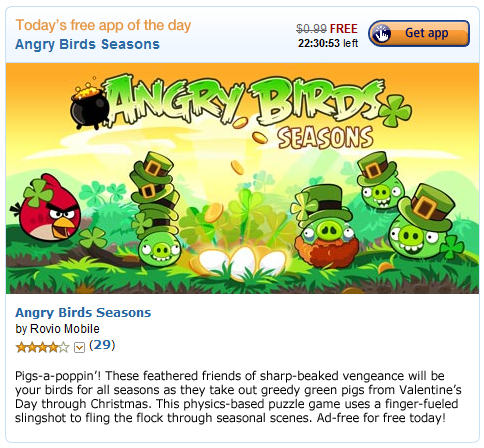 One of the most popular Android games, Angry Birds Seasons, by everyone's favorite developer Rovio Mobile went on a 1-day sale today as the free premium app of the day over at the Amazon Appstore. The only difference between the already-free version of the same name and this one is the absence of those annoying ads that pop up in the most ridiculous locations at the most inopportune times. 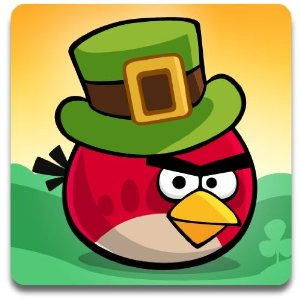 To grab Angry Birds Seasons that currently consists of 4 editions (St Patrick's Day, Halloween, Christmas, and Valentine's Day), proceed to the Angry Birds Season Appstore page. As always, you will need a U.S.-based Amazon account - Amazon hasn't announced plans for expanding into other countries just yet (although there is a workaround).